any discussion of this value-loaded question.The relations between ideology-power-knowledge in Zionism have produced asituation in which Israeli citizens of the present acquired political beliefs in thepast from which each has built his/her ‘mental map’. These maps will influencetheir decisions at the ballot box on the question of the future borders of the state. ideology, overtly or covertly (see Kaplen, 1963; Waterman, 1979). If we accept the hypothesis that scientific writing and human sciences cannot be value-free, how much more so must be the case of value-loaded writing prepared scientifically for an educational system. In a system comprising the relationships between ideology-power-knowledge, education (like the media) is an intermediary system. Society, with the help of the educational system, transmits and transfers knowledge from one generation to the next generation; in this way, society achieves continuity of values and survival of its ideas for the future. Control of education in the schools by society is one of the ways in which power in society communicates with knowledge, and through which the socialization of social loyalty and legitimization of power in the eyes of the next generation is achieved. place in the world (Muir and Paddison, 1981: 39). From the viewpoint of society, many countries have recognized the need to teach geography in the schools. This was particularly true when nationalism was rife in 19th century Europe, a factor which helped achieve the political aims of nationalism (Capel, 1981). It thus transpires that geography in schools has an important function to perform in shaping the association with territory and nationhood in that it is the discipline with the ideas that Taylor(1985: 195) labels ‘the basic trilogy: territory-state-nation’. is the border which encloses national sovereignty in a given territory. The approach to the issue of boundaries in the teaching of geography is related to the scientific coverage of the topic, which was widespread in political geography in the first half of the 20th century. (Minghi, 1963; Prescott, 1987). Scientific interest in the issue of boundaries declined as a result of the stabilization of political boundaries after World War II (Taylor, 1985: 104). It can be assumed that teaching the issue of boundaries is connected to the relations between power and knowledge. In an historical situation in which there is a need to legitimate sovereignty over a territory, scientific interest in and teaching of the topic aid the ideological claims over sovereignty. When the need for the legitimation of a territory declines, the issue usually becomes marginal. the developing world, and so on. Following the change of academic interest in boundaries,and after a certain time-lag, various countries throughout the world have made changes inschool geography, and have entered these changes in their curricula (Haubrich, 1991). The territory dealt with in this paper is known under different names: Palestine/Eretz Yisrael (the Land of Israel)/the State of Israel . (l) The topic of its territorial boundaries is an important political issue and one around which there has been much debate among the differing ideological world views in Zionism. The borders of the territory under discussion have not been in the past, nor are they today, only a regional problem between Israel and its neighbors, but have for the most part been the focus of world interest, following various wars (World War I, the 1948 War of Independence, the wars of 1967, 1973 and 1382) and following proposals and debates over their delimitation (various Commissions during the British Mandate period, U.N. decisions, disengagement agreements and the peace treaty with Egypt). For a graphic summary of the problem, see Gilbert (1979) upon which Figure 1 is based. The international political interest in the boundaries of the territory discussed here has been accompanied by research in political geography that has yielded several articles and books on this issue (Brawer et al., 1992). There are many states in which the boundaries, being relatively stable (e.g. theScandinavian countries or the United States), are a subject for scientific social researchrather than a subject for education (House, 1982; Rumley and Minghi, 1991). There areother territories in which the borders are unstable but where research in politicalgeography is undeveloped, such as southeast Asia, or where it has not yet developed, suchas in the new states of eastern Europe. It appears, therefore, that the case of Israel is quiteunique: a territory with variable borders, a developed scienti8c community and muchinternational interest. There are those who see the considerable amounts of research andquantities of publications on this topic as the expression of Zionism as an ideology which,in the choice of topics for research, serves the aims of power. In Israel, responsibility for education towards territorial socialization has been placedupon the discipline of geography. The teaching of the discipline in Israeli schools draws itstargets and ideas from both the development of geographic research in Israel and from thesocial goals of the state. How does formal geographic education in Israel react to thecontroversial question of the boundaries of the state’s territory? This issue is at the heart ofthe present paper and will be examined in historical perspective. This perspective isimportant for understanding the current political convictions of the adult population inIsrael who were educated in their youth toward the problem of territory. Many of today’sdecision-makers were pupils who received their values through Zionist education whichwas developed both in Palestine and in the Diaspora even before the establishment of theState of Israel. It is important to note that Zionism, as an ideology with organizationalability and economic resources, recognized at the very outset the importance of teachingterritorial identity, so that teaching of the subject of the territory of the Land of Israelreceived high educational priority, alongside the teaching of the basic skills of reading,writing and arithmetic (Zohar, 1940).In what follows, the educational messages relating to territory that were transmittedmedium of school textbooks and elù through geographic education are examined throughcurricula which were prepared for the Hebrew/Zionist educational system before theestablishment of the State of Israel, and for the state educational system following theState’s establishment. In line with behavioral perception (Muir and Paddison, 1981) it canbe assumed that these messages are not the only ones that determined the political beliefsof the current adult population, but there is no doubt that they reflect a wide socialconsensus within which there exists a pluralism related to the political interpretations ofrecent events in Israel. In the Hebrew/Zionist educational system in pre-state Palestine, a curriculum wasintroduced in 1907 and updated in 1923 (1923 Curriculum), following the granting of theBritish Mandate in Palestine. These curricula show continuity in the study topics ingeography (Bar-Gal, 1991). As part of the Zionist ideological conception, in whicheducation should promote a ‘love of the Land of Israel’, the geography of the countryreceived a considerable portion of the total study hours available in the school curriculum.Beginning at the end of the 19th century, geography textbooks were written in Hebrew. The close connections between Jewish/Zionist education in the Diaspora and that inPalestine encouraged a mutual use of the textbooks produced for each of theseeducational systems which were geographically, but not ideologically, separate.The problem of boundaries that confronted the authors of school textbooks at the endof the 19th century differed from those confronted by authors at later periods. For earlyauthors, such as Yudelevich (1894), Belkind (1897) and Grazowski (1903), the internalboundaries of the Land of Israel of the Turkish Ottoman Empire did not correspond withthe concept of the Land of Israel (Brawer, 1988; Biger, 1983). The boundaries of thecountry presented to pupils in the Hebrew educational system at the end of the Ottomanperiod were, with the exception of the maritime boundary, amorphous, and unclear by anyobjective standards. These rested on general descriptions of divinely promised bordersand the boundaries attained during the early Israelite period, in addition to some physicalgeographical elements. The bounds of the country were described using such phrases as’the land of our fathers’, ‘the good and fruitful land’, ‘a land of pastures and fruit-trees, andland of springs of water’. Biblical perspective aided the definition of the borders of thecountry such as ‘a land flowing with milk and honey’ in the midst of an ‘infertile desertenvironment’. This way of describing the country during the Ottoman period emanatednot only from an historical-religious approach to the question of the borders but alsofrom the lack of clear physical geographical elements bounding it, and the rejection of theOttoman boundaries as a basis for forming the boundaries of the Land of Israel. Dead Sea through the streams of the Negev to the end of Wadi el Airish, the river of Egypt,which empties into the Mediterranean Sea’ (Kamintzky, 1922: 5). In addition to stressingnatural boundaries, the 1930s Diaspora textbooks continued to see the Land of Israel asstraddling both sides of the Jordan and covering an area of about 30 000 sq. kms (Blanc,1930: 105). The most important of all geography textbooks of this period, used over several decades, was that of A.Y. Brawer. This book expanded and emphasized the issue of the boundaries. Brawer, a geographer educated at the University of Vienna, migrated to Palestine in 1911. He had been exposed to the political geographical ideas on boundaries current at the beginning of the century. After World War I, he discussed the issue of the borders of the Land of Israel, and published on this topic in 1919 (Brawer, 1919). 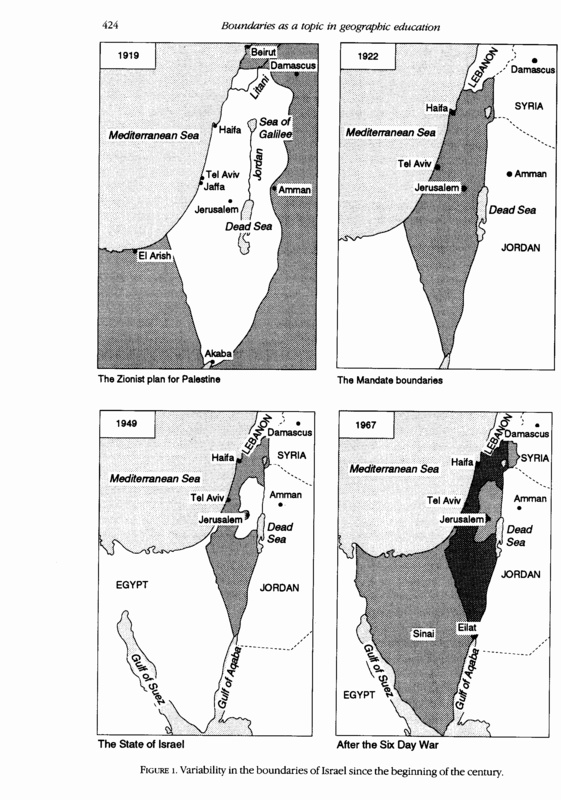 In his textbook, Brawer adopted the political geography ideas then current, and raised the issue of the contradiction posed by the different types of borders enclosing the territory of the Land of Israel (Brawer, 1936 edition: 2-5). One of the functions of the teacher in the work of rebirth [of the country] is to make the connection between the people and its land, a connection which had been broken, and to link the past with the present and the future… If we can succeed in making this connection, the sanctity of the Land will never be lost on our pupils throughout their lifetimes. was founded, the State Education Act and the Compulsory Education Act were enacted. only a small measure of pluralism in the study materials. available for Geography from the ages of 10 through 18.
from the north to the Sinai Peninsula and the Gulf of Eilat (p. 17). Peninsula, part of Egypt (pp. 421-428)! relief and history influence the distribution of the population (Curriculum, 1973: 17). which they absorbed during the time of their training. (state, communities, culture), rests on knowledge, such as education and communication. created under the influence of this ideology cannot thus be free of its values and aims. The details of this approach in the specific case under study are presented in Figure 3. FIGURE 3. The relationship between ideology-power-knowledge in Zionism. the historical borders of the country formed a subject in teaching and information. study) the question of the boundaries of the State of Israel and the Land of Israel. distinction began to appear among three kinds of borders: historical, natural and political. and Zionist activity would eventually bring about a closing of the gap. operations when at their height’. which the education was to be directed. There are two apparent reasons for this treatment. future alignment of these borders at the ballot box. the curricula which direct the authors of the books. Israeli political Right but an educational goal of the state educational system. not in need of any scientific geographic discussion or demonstration. educational system which can transmit messages both wittingly and unwittingly. be responsible for deciding on either war or peace. further layer to the understanding of these developments. resulted from the partition was given the name Medinat Yisrael (the State of Israel), or Israel. extremist circles to include territory east of the River Jordan. BIGER, G. (1983) Crown Colony Or National Homeland? Jerusalem: Yad Ben Zvi (Hebrew). BELKIND, Y. (1897). First Knowledge of the Land. Jerusalem: HaTzvi Press (Hebrew). BLANC, A. (1930). Know the World. Kishinev: Ascola (Hebrew). BRAWER, A. Y. (1930) Teaching ‘Moledet’ in Elementary School. Tel-Aviv: Dvir (Hebrew). BRAWER, A. Y. (1936)· Our Homeland. Tel-Aviv: Dvir (Hebrew). BRAWER, M. (ed.) (1975). Yavneh University Atlas. Tel-Aviv: Yavneh. BRAWER, M. (1988). The Border of Israel. Tel-Aviv: Yavneh (Hebrew). teaching of political geography in Israel. Horizons in Geography 33-34, 59-72 (Hebrew). BROWN, C. (1984). National identity and world studies. Educational Review 36, 149-156.
and A. Jenkins, eds), pp. 60-89. Oxford: Basil Blackwell. Ideology and Social Concern (D. R. Stoddart, ed. ), pp. 37-69. Oxford: Basil Blackwell. Department of the Zionist Organization. Grades 5-9. Jerusalem: The Ministry of Education and Culture. Curriculum. Jerusalem. The Ministry of Education and Culture. DUCHACEK, 1. D. (1970). Comparative Federalism. New York: Holt Rinehart and Winston. FOUCAULT, M. (1980). Power/ Knowledge. Brighton: The Harvester Press. GRAZOWSKI, Y. (1903). The Land of Israel. Warsaw: Toshia (Hebrew). Perspectives (A. D. Burnett and P. J. Taylor, eds), pp. 313-337. Chichester: John Wiley. HAREL, M. AND NIR, D. (1960, 1991). The Geography of the Land of Israel. Tel-Aviv: Am Oved (Hebrew). HOUSE, J. W. (1382). Frontier on Rio Grande: a Political Geography of development and Social Depravation. Oxford: Clarendon Press. KAMINTZKY, E. (1922). An Illustrated Geography of the Land of Israel. Warsaw: Alteneuland (Hebrew). KAPLAN, A. (1963)· The Conduct of Inquiry: Methodology for Behavioral Science. San Francisco: Chandler Publication. KLIOT, N. AND WATERMAN, S. (1990). The political impact on writing the geography of Palestine/Israel. Progress in Human Geography 14, 237-260. JENKINS, k (1985) Peace education and the geography curriculum. In The Geography of Peace and War(D. Pepperand A. Jenkins, eds), pp. 202-213. Oxford: Basil Blackwell. LAMM, Z. (1988). The land of Israel-the State of Israel: ideology and education. In the State of Israel and The Land of Israel (A Doron, ed. ), pp. 345-380. Beit Berel: Bet Berel Publication (Hebrew). MUIR, R. AND PADDISON, R (1981). Politics, Geography and Behavior. London: Methuen. MEINIG, D. W. (ed.) (1979).The Interpretation of Ordinary Landscapes Oxford: Oxford University Press. MINGHI,I. V. (1963). Boundary studies in political geography. Annals of the Association of Ammican Geographers 53, 214-228. NEWMAN, D. (ed.) (1985). The Impact of Gush Emunin: Politics and Settlement inthe West Bank. London: Croom Helm. NEWMAN, D. (1990). Overcoming the psychological barrier: the role of images in war and peace. In Political Geography of Conflict and Peace (N. Kliot and S. Waterman, eds), pp. 201-216. London: Belhaven. NEWMAN, D. (1931). Comment: on writing ‘involved’ political geography. Political Geography Quarterly 10,195-199. NEWMAN, D. AND PORTUGALI, J. (1987). Israeli-Palestinian relations as reflected in the scientific literature. Progress in Human Geography 11, 315-332. ORNI, E. AND EFRAT, E. (1972). The Geography of our land. Tel-Aviv: Achiasaf (Hebrew). PAPORISCH, Y. (1946). Knowing the Land. Tel-Aviv: Chichick (Hebrew). PAPORISCH, Y. (1960). The Land of Israel. Tel-Aviv: Chichidc (Hebrew). PRESCOTT, J. R. V. (1987). Political Frontiers and Boundaries. London: Allen and Unwin. RAZIELI (1966). Israel My Land. Tel-Aviv: Karni (Hebrew). RUMLEY, D. AND MINGHI, J. V. (1991). The Geography of Border Landscapes. London: Routledge. SAID, E., (1978). Orientalism. London: Routledge and Kegan Paul. SAID, E., (1980). The Question of Palestine. London: Routledge and Kegan Paul. SHACHAR, A., (ed.) (1988). Carta’s Atlas of the World. Jerusalem: Carta. SOPFER,A., (1982). A General Geography of the Land of Israel. Haifa: Gestelith (Hebrew). TAYLOR, P. J. (1985). Political Geography, World-Economy, Nation-State and Locality. London: Longman. WATERMAN, S. (1979). Ideology and events in Israeli human landscapes. Geography 64, 171-181. WATERMAN, S. (1985). Not just milk and honey, now a way of life: Israeli human geographysince the Six-Day War. Progress in Human Geography, 9, 194-235.YUDELEVICH, Z. (1894). The Study of the Land of Israel Based on its Natural and PoliticalCharacteristics. Jerusalem: HaTzvi Press (Hebrew).ZOHAR, D. (1940). The Land of Israel and Our Educators. Jerusalem: Jewish National Fund(Hebrew).